After two years of development we are very pleased to announce the launch of Handwashing Works! With Essity’s Hygiene Matters Campaign (now the Essentials Initiative) we discovered the need for more indepth hand hygiene education for children ranging from Daycare to Elementary School age. Diane Engler, Essity’s Director of Communications for North America, decided to take matters into her own hands and create a program for young handwashers to teach them the proper techniques. She started by visiting a couple schools and educating elementary school children through a lesson and a blacklight activity. She was even featured on FOX 29 Teaching Karen Fox the ins and outs of proper handwashing. In 2017 Engler of Essity teamed up with the School District of Philadelphia as well as Temple University to create a more robust program and a study to measure the success of the program. The study will be conducted by Heather M. Murphy, Ph.D., P.Eng and Deirdre Dingman, DrPH, MPH, CHES with support from Temple Graduate students. To ensure a proper study, guidelines were put in place to standardize the lesson plan and the criteria of the students involved. After some research it was decided that Pre-K was a great age to utilize for the study and Engler was excited about teaching younger children in their more formidable years. The study will consist of evaluating children at two similar demographic Pre-K schools and giving the handwashing education to one of the schools. Both schools will then continue to be evaluated, to see if the program made a difference in the educated children’s handwashing habits and health. Once the study is complete, the remaining school will receive the education and the study results will be published. The program consists of a lesson with colorful visuals as well as singing and a demonstration with the children mirroring handwashing steps. The children then test their knowledge by putting their newly discovered knowledge to work and participating in a blacklight activity which shows how well the children have washed the pretend germs off of their hands. To assist in the program, relatable children characters were created to promote healthy hand hygiene. 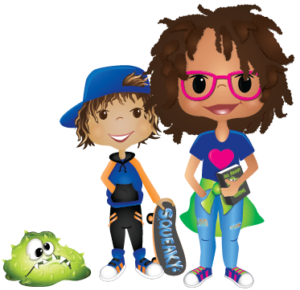 A girl named Zoey, who is an older elementary student and mentor, Jake, a younger boy who is learning to wash his hands, and Gunky Gus, a germ who likes to hide out and spread his goey germs. 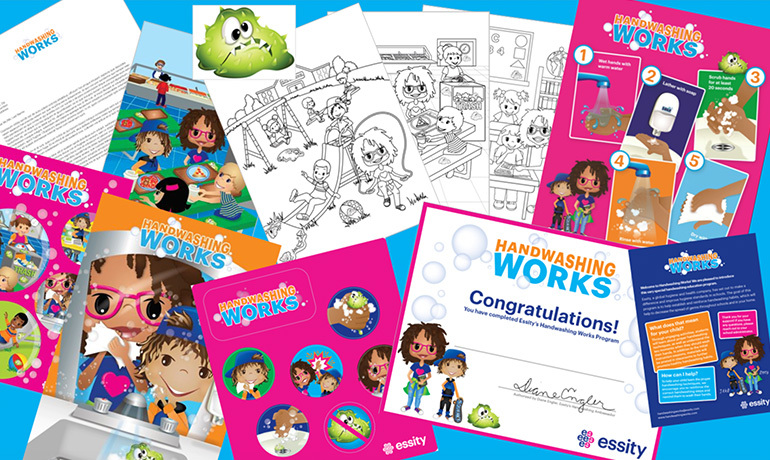 These characters were placed on posters, handwashing step sheets, coloring pages and stickers to entice the children and make proper handwashing more memorable. We are looking forward to completing the study and compiling the results!